Storm Hollow: A Storyboard Game is a roleplaying system in a box, focusing on simple, accessible mechanics and providing a framework for novice groups to dive right into storytelling adventures. That said, some prior knowledge with the genre will undoubtedly help get the most out of the experience. Jess and I have been avid roleplayers since college. There’s no way of counting of the collective number of hours (weeks? months? years?) which we have spent playing Dungeons & Dragons, GURPS, Vampire: The Masquerade, Pathfinder, and Dungeon World (and so, so many others), but suffice it to say that we’re huge into the collaborative storytelling genre. 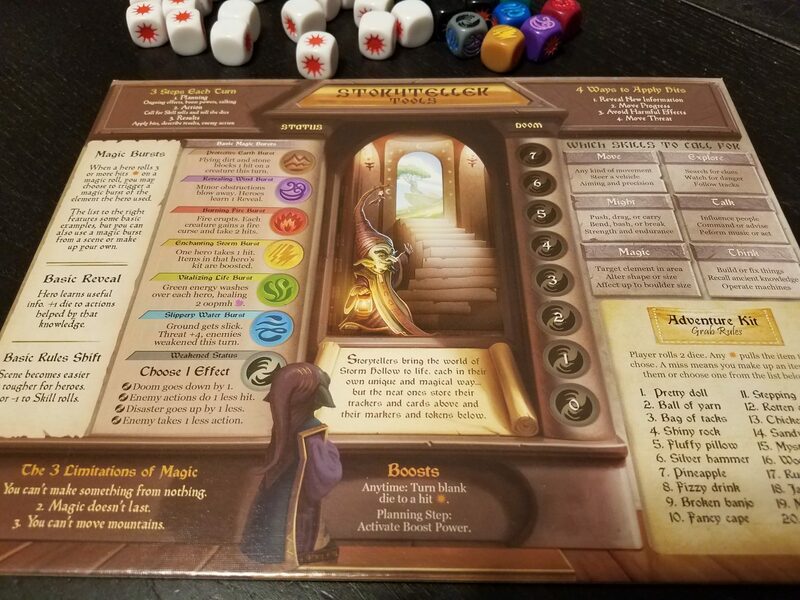 So when I got a look at Storm Hollow: A Storyboard Game, I found myself quite curious – the system and theme seemed both designed to encourage younger gamers and their families to get into the genre. The beginnings of what you need. 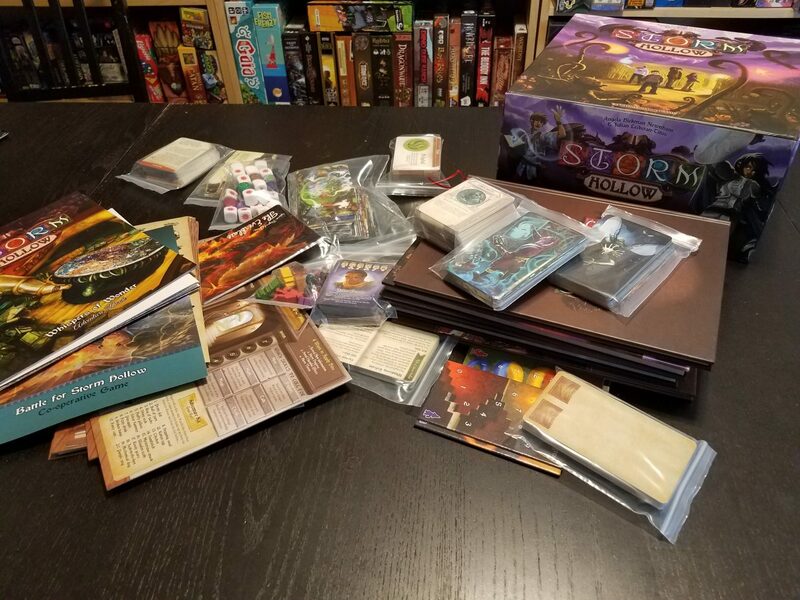 When the giant box of Storm Hollow showed up, it took me a little while to get oriented. The product of a successful Kickstarter campaign, the veritable crate which appeared as a result of our expressed interest in reviewing the game was laden with a sizable pile of books, dice, maps, player’s guides – equivalents of all the bits and pieces of gaming systems that I generally accrue over time, rather than suddenly finding all at once. 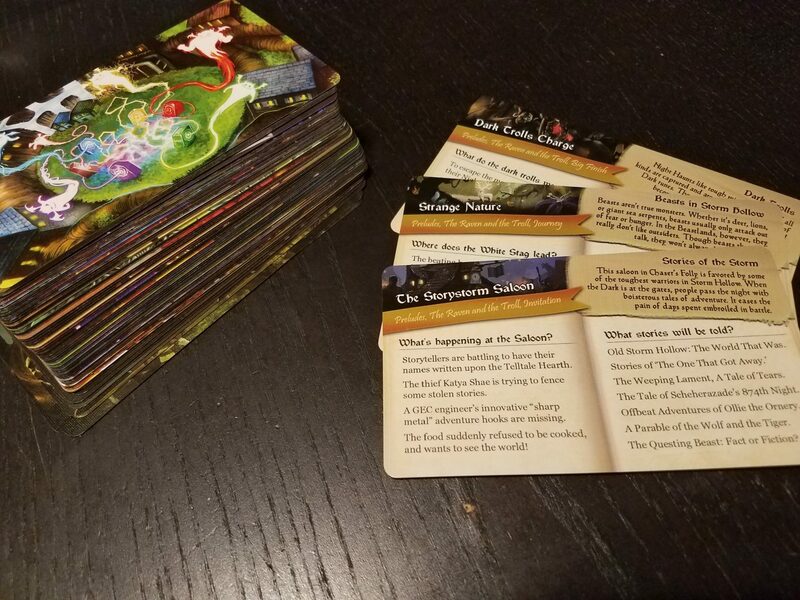 However, the good news is that, despite the volume of content already available for Storm Hollow, diving in and playing only takes a bit of prep work. The books are well-written, providing lots of examples and generous illustrations. 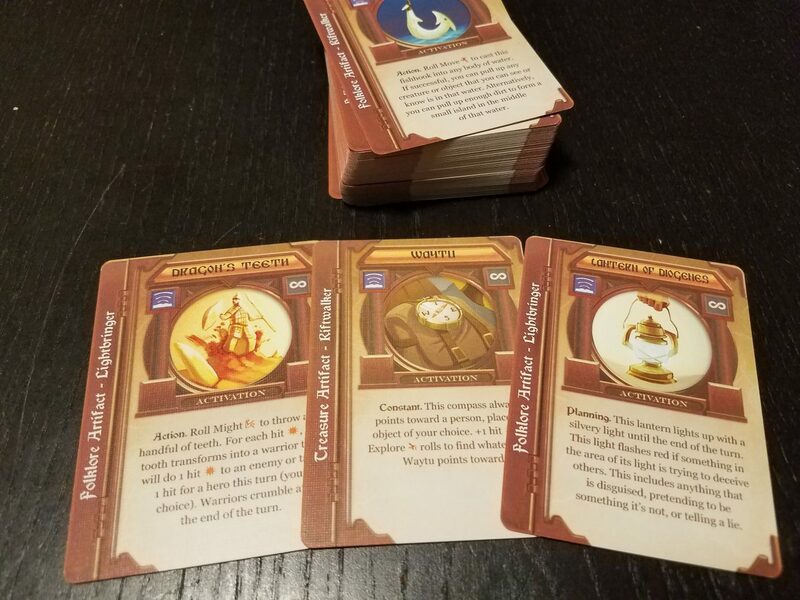 The fluff of Storm Hollow (fluff: gamer slang for storyline, setting, plot details, and anything else that isn’t a rule) is clearly inspired by the classic stories of a generation past. The world of Storm Hollow is a melange of bedtime classics and fairy tales of all stripes – the introductory materials describe a world of light and laughter; magic is everywhere and stories have the power to create and alter the very fabric of reality. It is also a land of shadows – monsters, collectively called Night Haunts – which lurk at the thresholds of the Dark Doors, eager to get their claws into all manner of mischief and harm. And most of all, it is a land which calls out to heroes; in the grand tradition of tales like The Chronicles of Narnia, the land of Storm Hollow calls heroes to it from other worlds when a task needs doing. These heroes (the players) are collectively called Poppins (because they ‘pop in’, you see) and are woven into the legendary histories of Storm Hollow. Jess: The lands and peoples of Storm Hollow are diverse and interesting. They feel, in broad strokes, like elemental fantasy facets – no dwarves or elves here, but there are plenty of familiar-feeling races and stories to be found amid the new and interesting fiction. 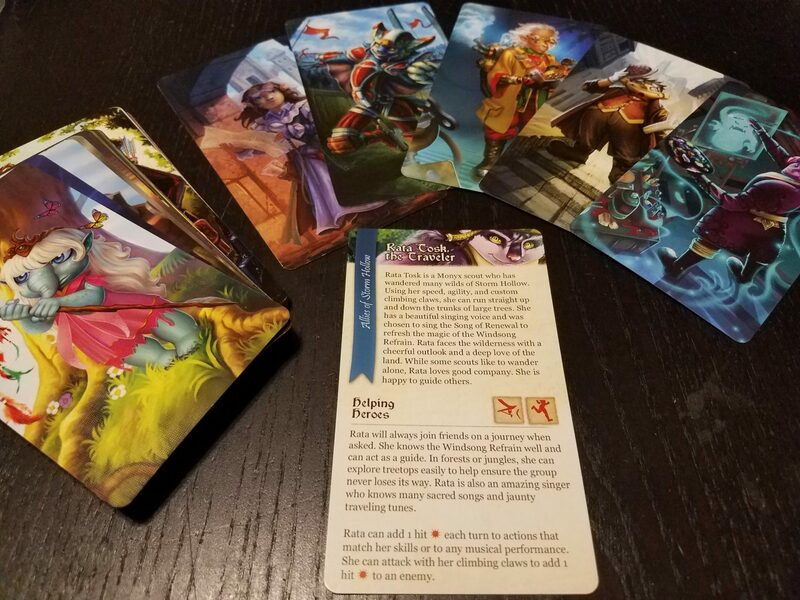 By keeping things closely tied to the whole fairy tale experience, Storm Hollow evolves from an easy-to-recognize core DNA, making it very accessible indeed. As to the crunch (the rules and mechanisms; opposite of fluff), Storm Hollow does some things very, very well. 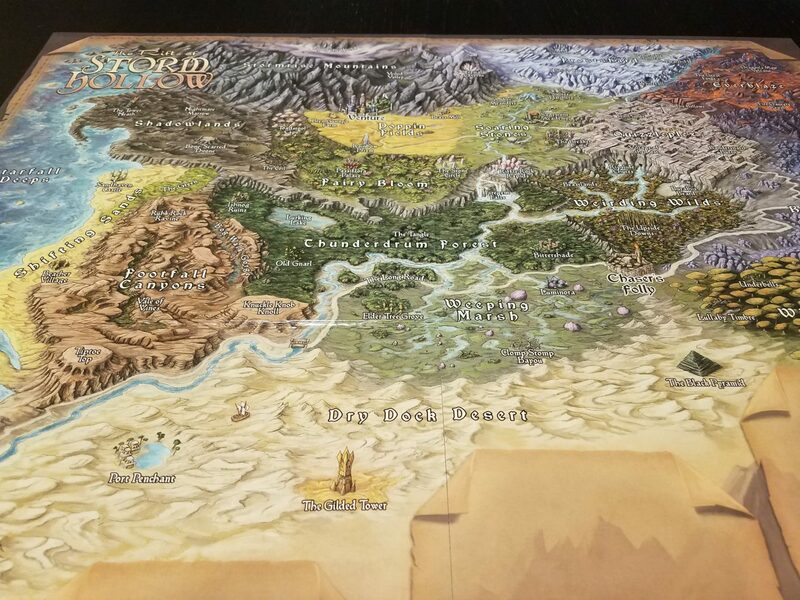 Each player (aside from the storyteller, who acts as the classic Dungeon/Game Master from all those roleplaying systems I listed at the beginning) will take on the role of a poppin, claiming the relevant player board. 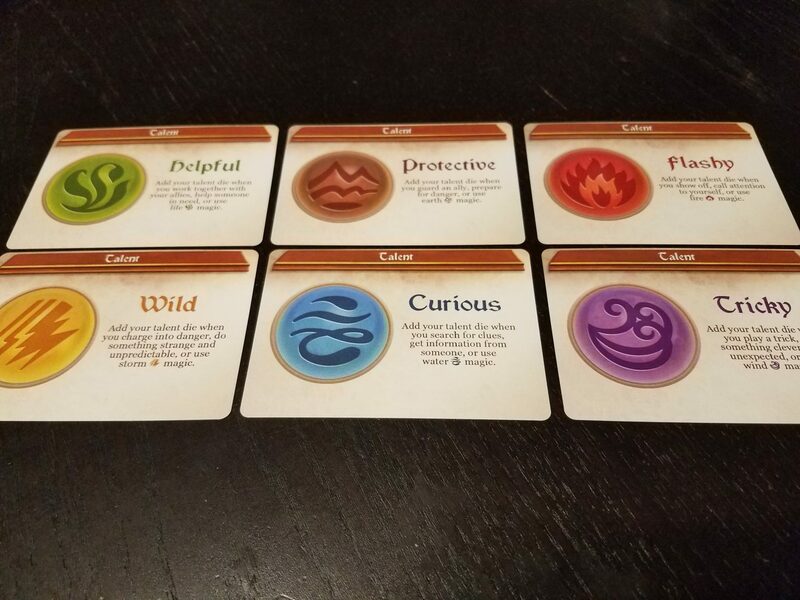 Each poppin type has a different focus and a couple of different special abilities, as well as different dice pools for each of the common skill checks. 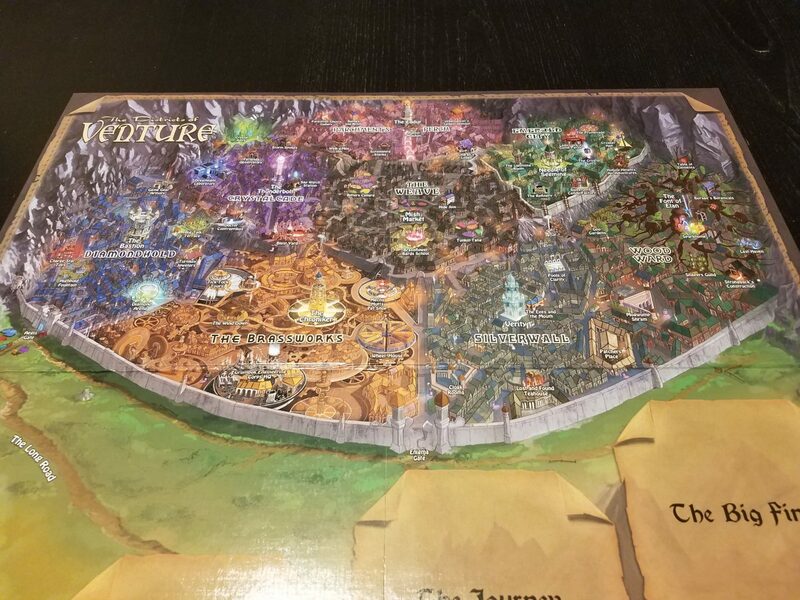 An example of a player board. Class-specific rules, spaces for your stuff, tracker for your life; everything you need. Lightbringers are made to stand against the darkness, guided by and strengthened by the light itself. Riftwalkers are connected to the lands of Storm Hollow, learning secrets from the world instinctively and shifting the energies of the land beneath them. Sparkcallers command the elements even more easily than other poppins, and are accompanied by companion elementals. Stormchasers tap into the primal power of the storms of Storm Hollow. Talespinners gain powerful insight into the peoples and places they pass through, and can use their own stories to inspire greatness. Whizbangers are gadgeteer-savants, construction mechanical assistants in a flash and drawing useful gear from their seemingly bottomless pockets. Every character has a background trait as well, giving them an extra die under certain circumstances. In addition to these classes, poppins all have talents and magic, as well as kits of knicknacks and tools which they may creatively be able to use to solve problems and overcome challenges, as well as potent artifacts with stories all their own. 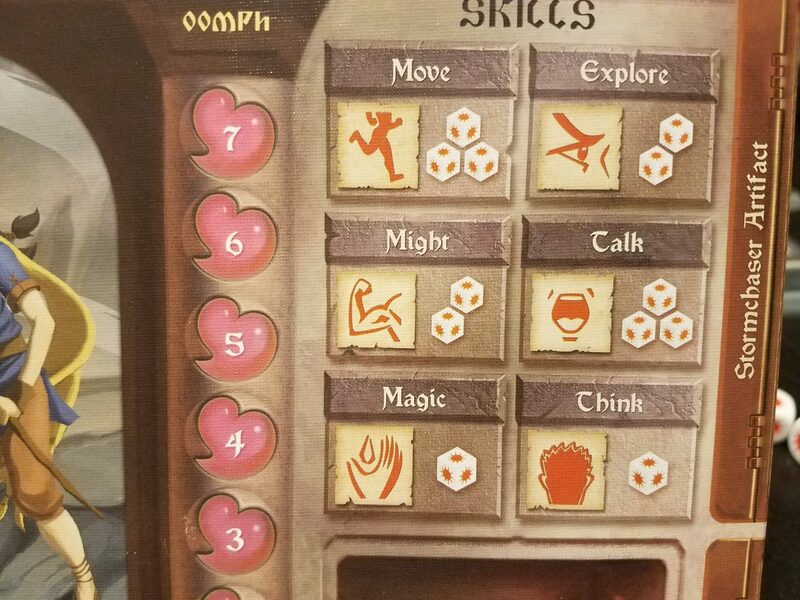 The skills to pay the bills, though the rules pretty much say that ‘money’ is an immaterial concept to players in Storm Hollow. 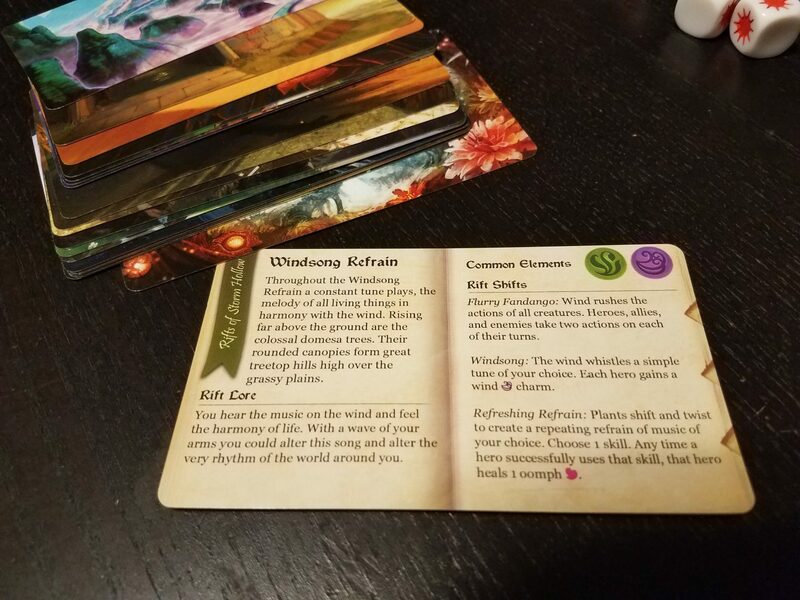 Andrew: One of the things I really loved immediately about the classes of Storm Hollow is that they draw from classic archetypes, but leave enough room for creative flair that they will encourage players to make each their own. I also like that they simultaneously defy genre conventions – there is no ‘fighter’ or ‘wizard’ or ‘rogue’; everyone is magical and everyone has strengths and weaknesses, so no one class feels indispensable or ‘basic’. Everything the Storyteller needs…aside from the skill to tell stories. The same cannot be said for the storyteller, who must take on the challenge of voicing the entire world around the other players. 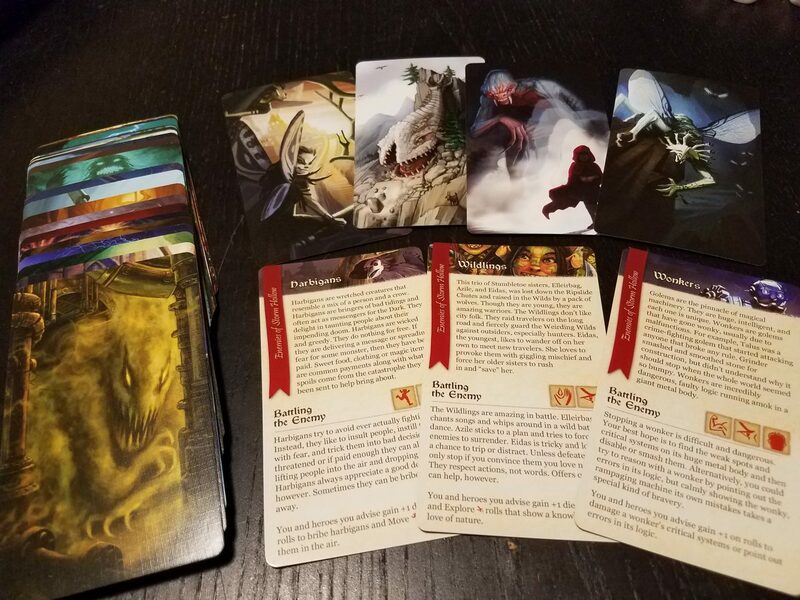 The storyteller’s job is made easier by the structure of Storm Hollow; each written adventure is broken out into three scenes, and storytellers are given the structure of what each scene entails and what players can do to advance from scene to scene. A series of trackers let the group easily keep track of their progress (as well as the progress of the bad guys), and when the appropriate tracker is full, the game transitions to the next scene, for better or worse. 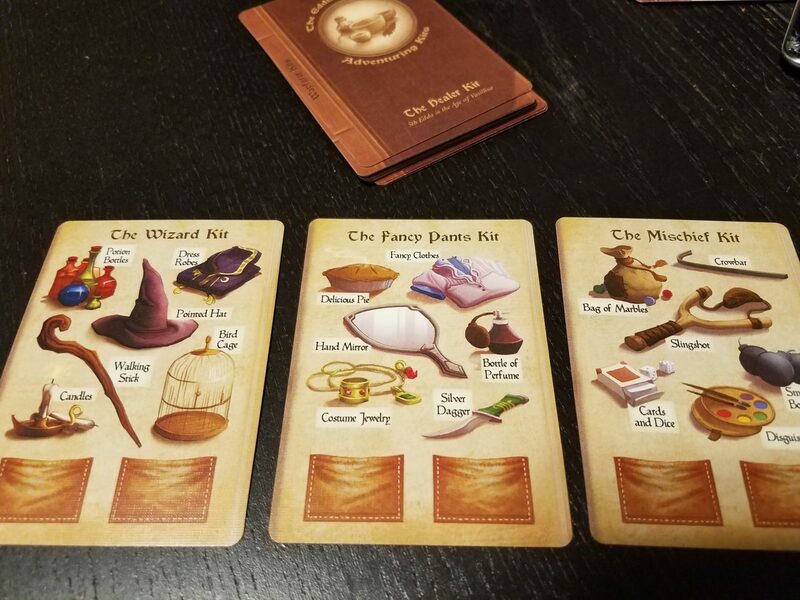 Each adventure has 3 scene cards, with knowledge that the players can learn and goals for them to achieve. 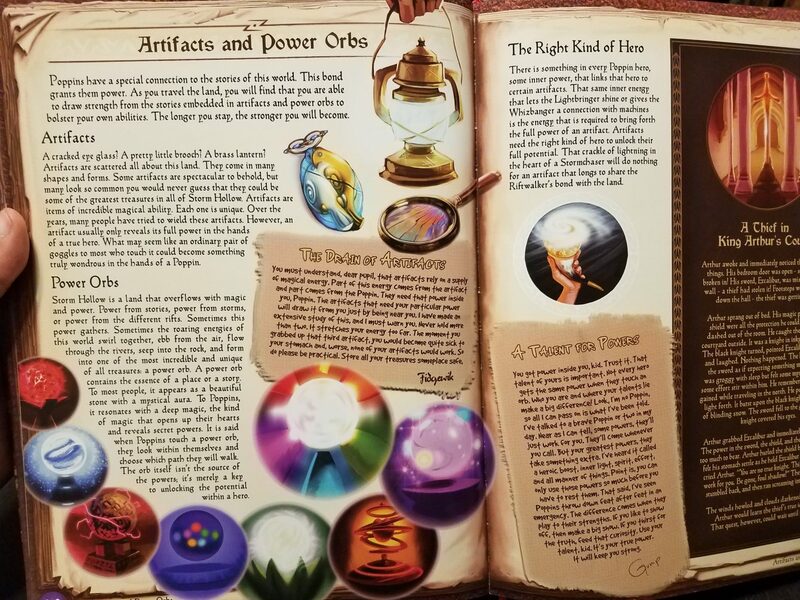 Within each scene, the players are presented with a series of challenges – enemies to bash, evil magic to dispel, allies to work with, etc., and the players work as a group to overcome these obstacles. 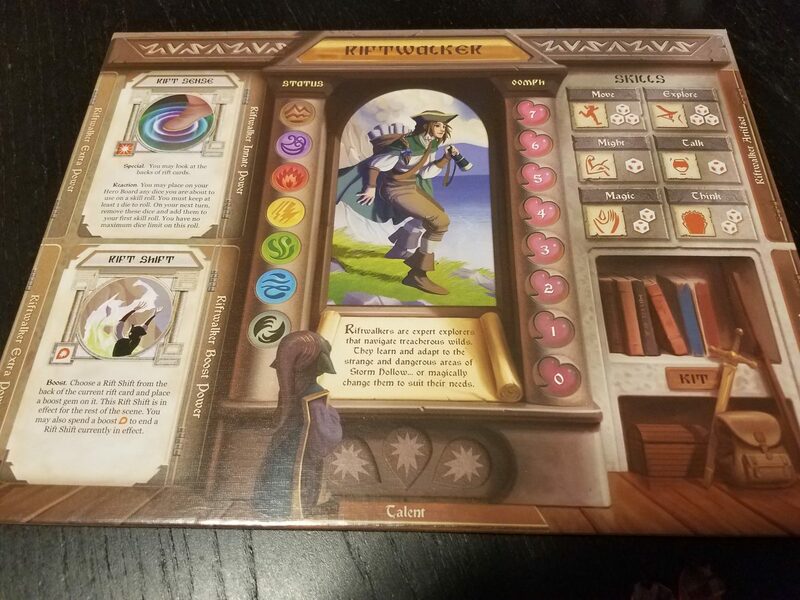 The turn structure of the game is fairly loose – the players all agree on what they will work toward, each one describes their character’s actions, and then the storyteller calls for skill rolls. How will these things be useful? Up to the players to make that happen. 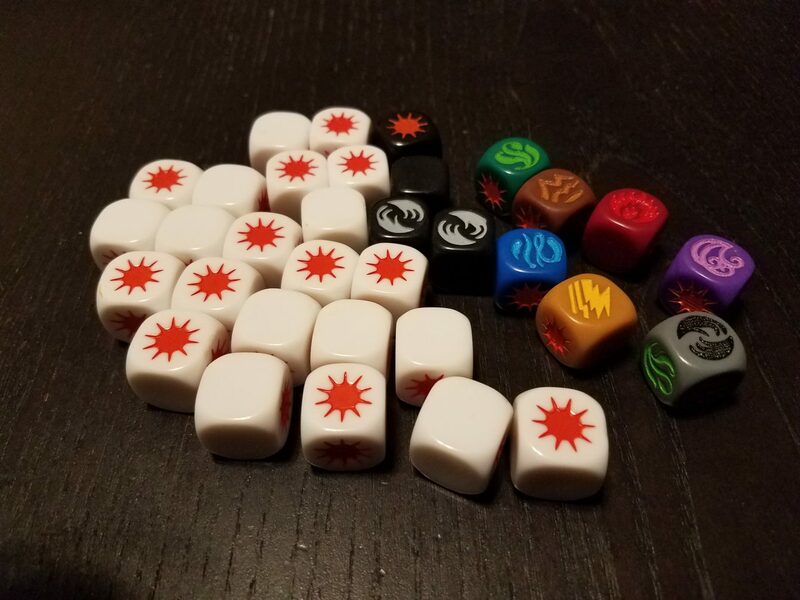 These rolls are made with Storm Hollow’s custom dice, with the number of dice dependent on the skill pool of the character, plus whatever bonuses or penalties apply. In a smart bit of design, successes are rarely binary – even if you score no ‘hits’, Storm Hollow encourages storytellers to keep the scene moving, either rewarding lesser successes or success with unforeseen consequences. Andrew: As veteran roleplayers of a dozen RP systems, we hugely applaud this approach. There is nothing more frustrating in a game than ‘bad roll, nothing happens’; teaching novice gamers to be better than this tired convention is a step in the right direction, for sure. Trackers to keep things moving. One of the challenges of creating a friendly, accessible roleplaying experience for beginners and experienced players alike is the burden of the storyteller (or GM, or dungeon master, or whatever they are called in your system). This participant must manage the lion’s share of responsibilities at the table, translating the written adventure into playable scenes. Allies to see you through. Andrew: While Storm Hollow certainly works to make this as easy as possible, the fact remains that, simply you get out of it what you put in. Beginners can get away with just reading the materials for the scenarios aloud, but you will absolutely benefit from a storyteller who is unafraid to expand and improvise, adding depth and life to these scenes. Jess: Totally. Storm Hollow may present itself as a ‘game’, but it’s a roleplaying system for sure, and it can only do so much of the work for you. The limits are your creativity and flexibility, and while veteran gamers may find it a little simplistic (while still being delighted by the creativity of the setting), novice players may struggle with the Storyteller role – but that’s just the nature of the beast. Artifacts can be incredibly powerful under the right circumstances. 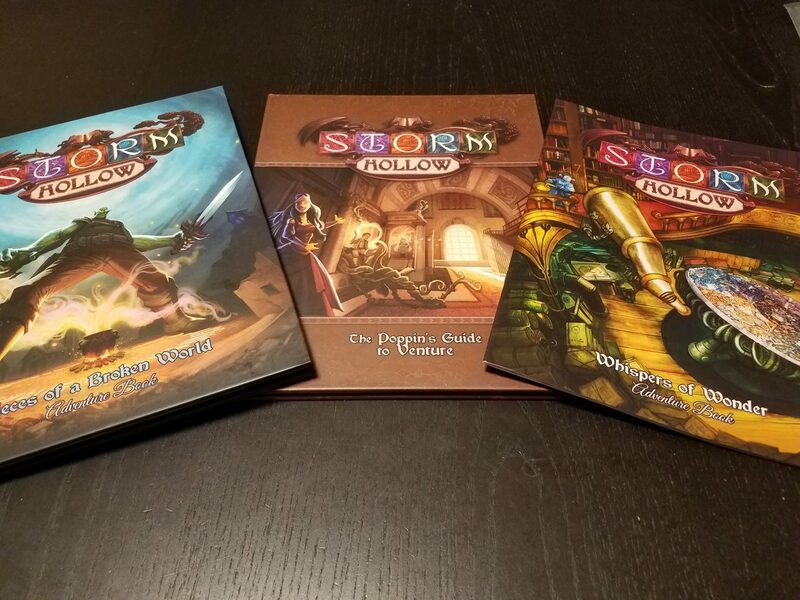 Out of the box, Storm Hollow is successful in many ways – there are lots of adventures already written, and the world of Storm Hollow is inviting and exciting, featuring some amazingly creative locations and concepts. 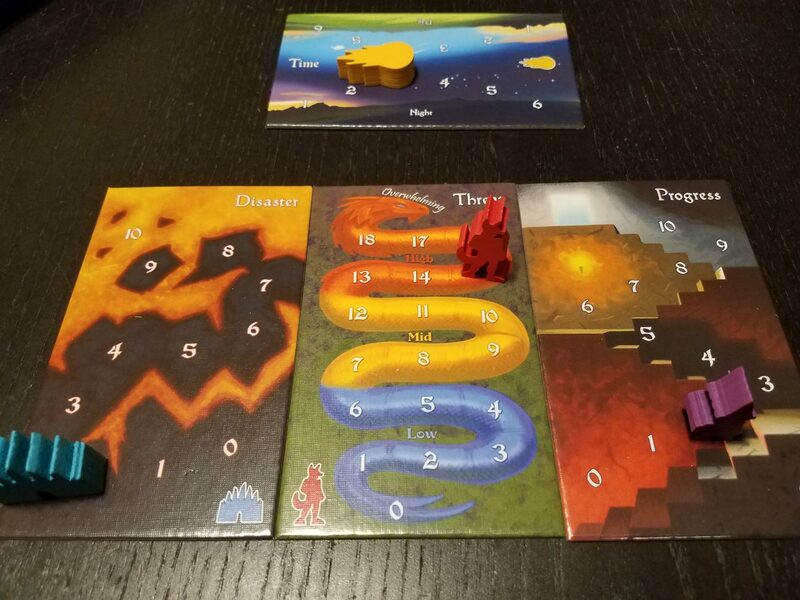 The mechanisms are simple and elegant – your skills tell you how many dice to roll, and each die will either provide a success (a hit) or not. Unique cards for unique locations. What falls under ‘Rift Lore’ and ‘Rift Shifts’ is unique knowledge that is only available to the Riftwalker of the party. The storyteller has lots of tools at their disposal, from scene cards to maps to trackers, to keep the story organized and the game flowing, and the poppin players are encouraged to be as creative as possible in tackling the challenges they face. Enemies are sinister, sometimes even menacing, but rarely horrifying. Andrew: And ‘challenges’ is the right word. Storm Hollow describes itself right up front as a world without death – nasties are driven away, poppins are knocked down, but no one dies. Family friendly, sure, but more importantly it sets the tone – though the scenarios can range from goofy to spooky, we’re not going to be seeing abattoirs of corpses or whatever. Get your dark fantasy elsewhere – Storm Hollow is decidedly something else. Jess: For sure. I thought that of the scenarios we’ve played through (we certainly haven’t gotten through all of them) there was enough variety in tone and content that it still felt interesting and engaging, and I’m quite interested in exploring Storm Hollow some more. Of course, Storm Hollow is trying to do a lot, so it doesn’t do everything equally well. 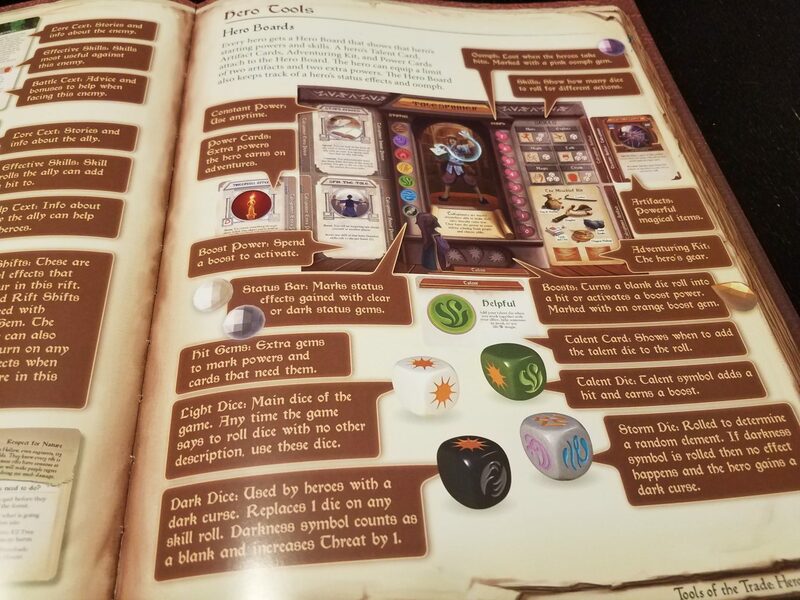 The biggest thing to keep in mind is, as we’ve touched on, you need to power the stories of Storm Hollow with your group’s creativity and imagination – nothing in these books or pretty custom dice will save you from that effort (no different from any roleplaying system, of course). And since everything is dice-based, it’s up to the skills of the GM to keep the game moving even when bad luck rears its ugly head, and that’s a skill that can take time to develop. All that said, Storm Hollow is an excellent starting point for any group containing younger would-be roleplayers (also, more seasoned folks who are attracted to a feather-light system and less traditional world). 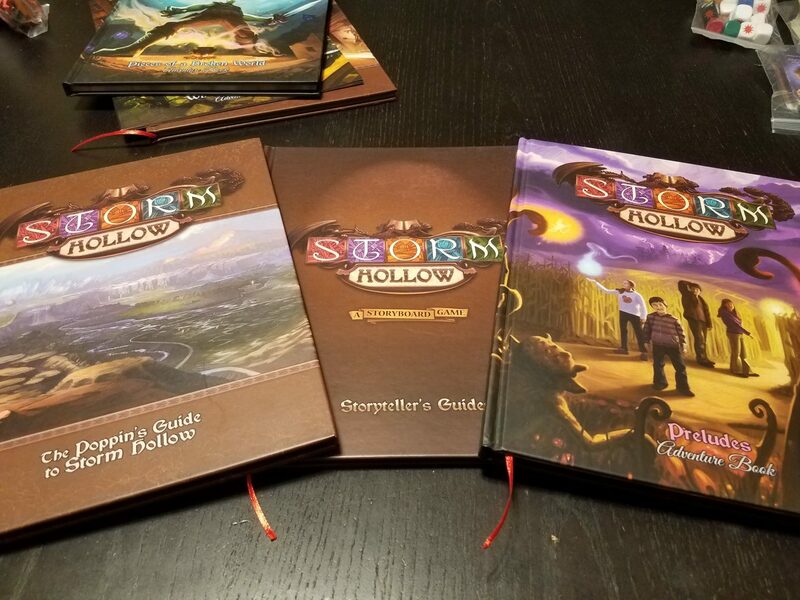 We are fascinated by the world of Storm Hollow, and we are appreciative of the lengths the designers went through to make a system which is accessible and encourages creativity above all else. While it won’t replace our core RP systems any time soon, both the fluff and the crunch in Storm Hollow: A Storyboard Game are absolutely worth exploring, and could easily form the foundation on which new roleplayers learn the essential skills of this incredibly enjoyable, rewarding hobby.